The Tangerine Snowflake Ocellaris have heavily hindered melanin production. When compared to normal Tangerine Albinos Ocellaris, Snowflakes have exaggerated barring with unique patterns. Despite these intriguing patterns, Snowflakes still have three separate and distinct white bands. They have no black between the bars nor do they fade from top to bottom. What little melanin is produced seems to be limited to the pelvic fins. This morph was found in our grow out tanks and is the offspring of two wild caught Ocellaris. We have not noticed any behavioral differences among the Tangerines. 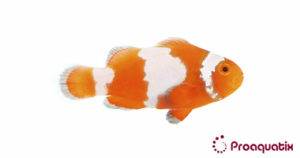 Like all clownfish, the Tangerine Ocellaris is a sequential hermaphrodite. The largest individual present will exert dominance and become reproductively female. The next largest fish will become reproductively male. Remaining smaller individuals are usually tolerated but will not be reproductively active.